dhtmlxSidebar represents easily-customized vertical navigation menu. The component perfectly works in all major browsers (Chrome, FF, Safari, IE, Opera). The sidebar widget can be used both as a stand-alone component for building web and mobile apps, and can be integrated with other DHTMLX components in just one command. There are 5 predefined templates (details, tiles, icons, icons_text, text) for displaying the elements of items, and you can also easily create your own custom template. The skin of dhtmlxSidebar can be chosen from 4 predefined skins or generated by means of our online Skin Builder. Create a support request and get fast and qualified help from our support/development team. 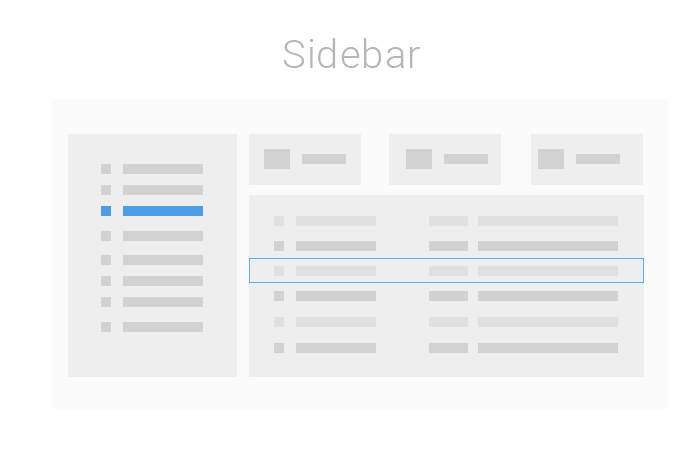 Our detailed documentation can learn how to use Sidebar and effectively implement it in your own applications. It provides the detailed information regarding each aspect of the widget. If you don't have an active support subscription, you are welcome to post your technical questions to our forum. It's moderated by our official support team.